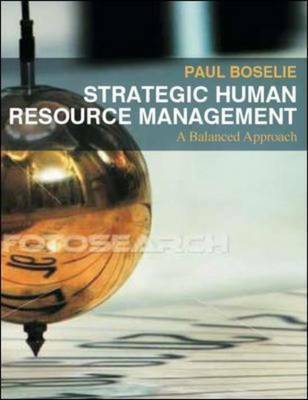 Paul Boselie's "Strategic Human Resource Management" offers an engaging and comprehensive discussion of the factors that address the shaping of HRM in organizations. This book addresses key questions such as: How can an organization create an agile and sustained competitive environment without violating individual employee well-being? How can we cope with work life balance issues and maintain flexibility in firms? How can we manage the older worker in an ever aging population? What lessons can be learned from stakeholder management in highly institutionalized contexts? How can be balance the employee and the employer perspective? What is the impact of human resource management (HRM) on performance? This title features: cases from companies such as Air France-KLM, BMW, ING, and Nokia - these have been specifically chosen to help illustrate the theories presented in this book in both a European and wider global content; the multilevel approach including the individual employee level, teams, business unit level, organizational level, sectors/populations, and countries; the blending of Strategic HRM with Micro HRM; and, Strong Pedagogy - each chapter provides a wealth of interactive exercises, to suit seminar and individual study, including stop and reflect boxes, questions for study and discussion, experiential exercises and case studies linked to chapter topics. This book has been written for students with some prior knowledge of human resource management. An Online Learning Centre accompanies this book and provides the following resources: Lecture Outline; PowerPoint Slides; Additional Case Studies; and, Additional Questions and Exercises. Paul Boselie is a Professor in Strategic Human Resource Management (SHRM) in the Utrecht School of Governance at Utrecht University (the Netherlands) and an Associate Professor in SHRM in the Department of HR Studies at Tilburg University (the Netherlands). His research traverses human resource management (HRM), institutionalism, strategic management and industrial relations. 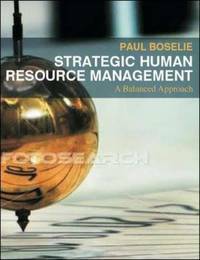 Paul Boselie is a Professor in Strategic Human Resource Management (SHRM) in the Utrecht School of Governance at Utrecht University (the Netherlands) and an Associate Professor in SHRM in the Department of HR Studies at Tilburg University (the Netherlands). His research traverses human resource management (HRM), institutionalism, strategic management and industrial relations.